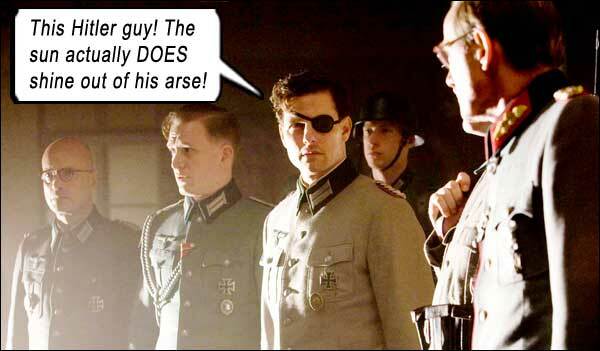 When I heard Tom Cruise was to play a World War II Nazi, I laughed my LMAO off. Tough sell for a non-actor. And by non-actor, I mean movie star. And by movie star, I mean he can’t act.But then it all comes clear. The role was Colonel von Stauffenberg, who was involved in one of the more famous assassination plots against Hitler – so Cruise was not really being asked to extend his acting bone; he was a disenfranchised Nazi, a veritable “liberal” in America’s eyes. He was a traitor to the Germans, but you know what they say: One man’s traitor is another man’s Cruise. And, ludicrous as it may sound, Cruise and director Bryan Singer (X-MEN) actually boast of the “risk” for Cruise in taking such a role. What risk? His character is the Hero, with a beautiful wife (Carice van Houten) and four loving, blond kids (cos he’s German, see); he’s principled, a born leader, and hates the Nazis so much he’s practically American. He doesn’t even speak German in the film! Associated Press actually published this stupid article: Tom Cruise taking risk with Nazi film `Valkyrie’. Bad Guys are British, right? Staple of Hollywood. 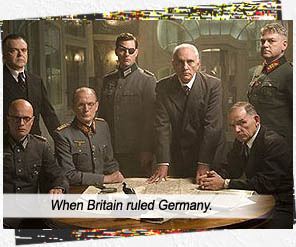 So casting them as Germans was no stretch, but director Singer ensures that the “good” Bad Guys (i.e. traitors) are all British actors and the “bad” Bad Guys (i.e. Nazis) are actual German actors. Then there’s Tom. Fruiting about the authentic-looking WWII backdrop, in no way trying to inhabit the role of a one-handed, eye-patched, high-ranking German Chief of Staff. Just Being Cruise. The American accent is bad enough. (We give the filmmakers credit here for the artful way they suspended our disbelief in everyone speaking English: the opening titles are written in German, and morph into English, then we hear Cruise speaking German with English subtitles, cross-faded into him speaking English.) We get the point of the translation for our lazy Western ears, but there is more to a role than an accent; Cruise gives it nothing more than Cruise. We do not lose ourselves in this “German’s” conflict – committing the highest crimes known to man since Judas Iscariot. It’s Tom Cruise, eat your popcorn. The two things foremost in my mind were Cruise’s ingenious bluescreen glove he’s obviously wearing, and how hard the Shakespearean vets on set must be laughing at his babyboy acting chops over lunch. “Valkyrie” was the code-name for a plan that called for Germany’s Home Army (led by Thomas Kretschmann – he was the Euro boat captain in KONG 2005) to hold major German cities in case of a revolt from the millions of foreign laborers. Stauffenberg says, “I’ve rewritten Valkyrie” (which is ironic, considering the filmmakers re-wrote the events of Hitler’s assassination in VALKYRIE as well) – an idea which comes to Stauffenberg while listening to Wagner’s Flight of the Valkyries (somehow Singer squeezed it in). The plan: to kill Hitler – with a good old-fashioned time-bomb (with no Roger Ebert Red Digital Readout!) – then report that SS radicals were trying to take over the cities, which would allow the conspirators to mobilize the Home Army to arrest all SS officials. This would nullify Hitler’s main Gestapo bulldog, Himmler. Stauffenberg plants the bomb in a briefcase near Hitler during a staff meeting. It detonates, seemingly killing everyone in the room. The Home Army started its takeover of major cities, but just as Germany was about to become the United States of Tom Cruise – Hitler was discovered alive and made a public radio announcement to proclaim his survival was divine. Just as the conspirators were saying, “I love it when a plan comes together,” the Home Army is re-claimed by the Nazis. As Stauffenberg’s orders go out over the wire to arrest SS officers, orders issue from the Wolf’s Lair (Hitler’s HQ) to arrest Stauffenberg. The wire operators chose to send on The Fuehrer’s orders and ignore Stauffenberg’s. Stauffenberg’s plan had to work, so he made no effort to hide his tracks. He was discovered and executed within the 24-hour period when Valkyrie was launched on 20 July 1944. He was executed 21 July 1944.
aka: OPERATION WALKURE – DAS STAUFFENBERG-ATTENTAT. Writers: Christopher McQuarrie, Nathan Alexander. Starring: Tom Cruise, Bill Nighy, Eddie Izzard, Tom Wilkinson, Kenneth Branagh, Kevin McNally, Terence Stamp, Thomas Kretschmann, Carice van Houten, Ian McNiece, Christian Berkel, David Bamber, Jamie Parker, Tom Hollander.